At Village European, we are passionate about how a car should drive. 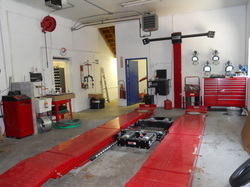 All wheel balancing and alignments are performed in house by our technicians. This allows us to control the quality of the work. We use a state-of-the-art Hunter alignment system that is updated and calibrated annually. We also use auxiliary measuring tools to ensure the chassis ride height is as specified. This allows us to ensure that the geometry of the chassis is as designed. Certain models of vehicles can not be aligned to specification without correcting ride height issues. We have the knowledge and the tools to address these concerns.